Easy Coleslaw Monsters are the best of both worlds – a healthy side dish or snack and a simple way to encourage your kids to try something new. Even picky eaters will want to take a bite out of these easy coleslaw monsters, and the sweet and tangy vinegar dressing will ensure that they come back for second and third bites. 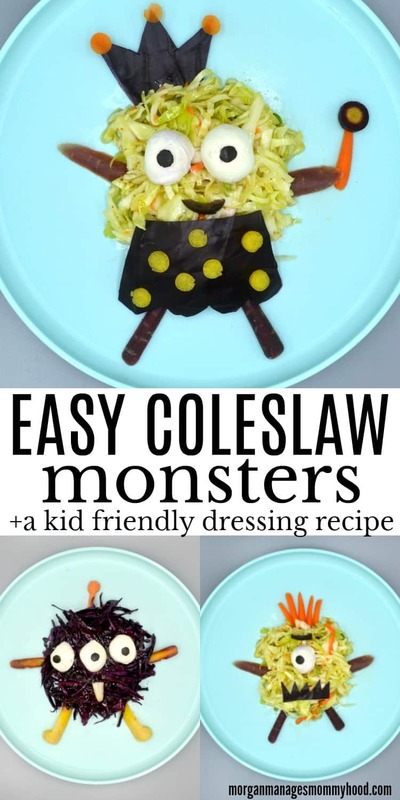 And my favorite part – these easy coleslaw monsters only take a few minutes to put together! It’s Morgan from Morgan Manages Mommyhood and I am so excited to be here with you all and sharing these Easy Coleslaw Monsters! Recently, in the middle of the night, Ryan woke up in near tears telling me that the monsters had tried to eat him. Now, I had 2 kids in 21 months. Both of them were and are terrible sleepers, so after over 4 years of not sleeping through the night, I have little to no sympathy for night waking. But there really is something about your kid waking up absolutely terrified of a nightmare, isn’t there? So I spent an hour talking to him, consoling him, and generally attempting to get him to calm down and go to bed. And then after that, I laid in his little red race car bed (as moms do..) staying up and thinking about this whole monster situation. How do you convince a 3 year old a monster isn’t going to eat him? You let him eat the monster first, of course. Which brings us to these easy coleslaw monsters. Easy coleslaw monsters come to the table bringing two benefits – they’re fun to eat and they offer you a chance to serve your picky eater something not really kid friendly (cabbage!) without the struggle. As a mom of a 3.5 and not-quite 2 year old, I know how difficult it can be to get your kids to try something new. And getting your kids to eat something like cabbage, which even some adults will raise an eyebrow at – well, it’s not easy to say the least. 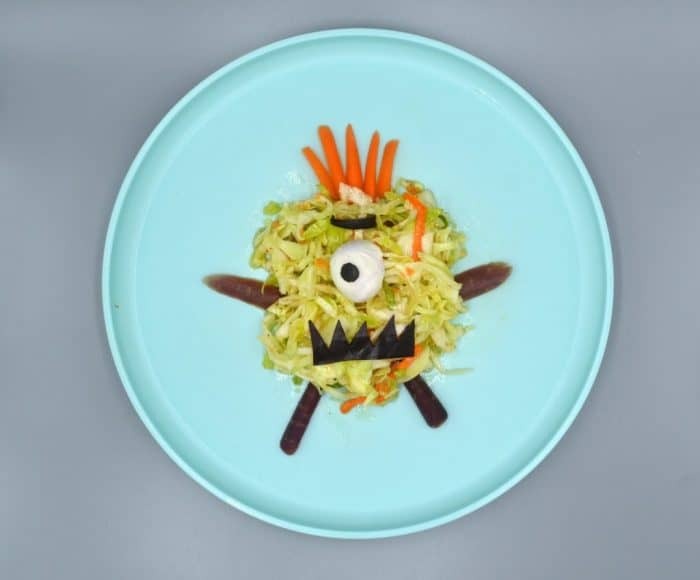 With these easy coleslaw monsters, you’ll be able to entice your kids to at least try it, while the honey sweetened dressing will have picky eaters hooked. Easy coleslaw monsters made with a sweet honey dressing makes eating cabbage simple for your picky eaters. 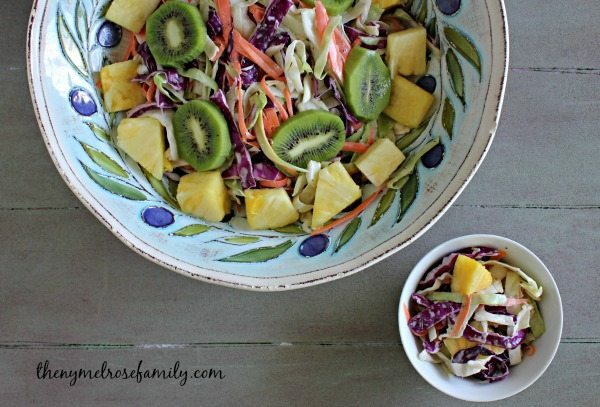 An easy coleslaw monster dressing is the perfect dressing to get your picky eater to enjoy cabbage. Whisk together the easy coleslaw dressing. Starting with about 1/4 cup of dressing, toss with your coleslaw mix. Add more dressing as desired. This recipe only gets better the longer it sits - serve immediately or make the night before and serve the following day. You can also use bagged coleslaw mix in place of shredded cabbage. Any kind of vinegar works, but I like apple cider! 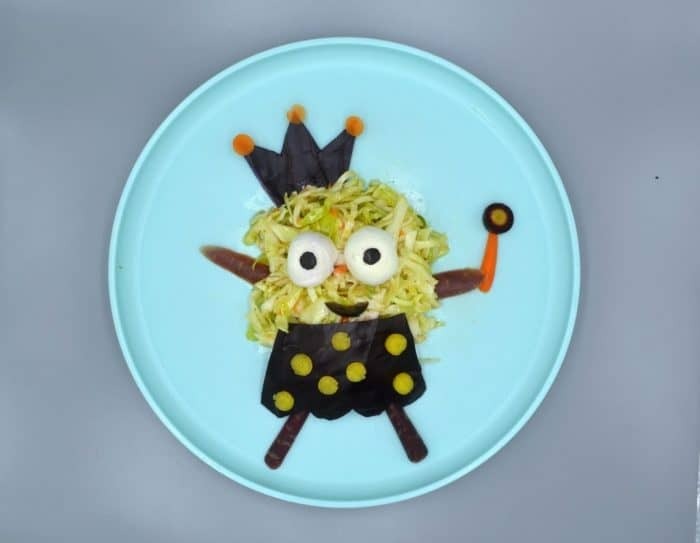 Assembling these easy coleslaw monsters is also super simple – place a mound of coleslaw on your plate and use carrots, cabbage, grape tomatoes and celery to make a silly monster. Slice baby carrots or grape tomatoes to create eyes – I like using purple carrots as they have a yellow center almost like an iris. Big, round grape tomatoes give a fun, googly eyed alien look! Use small sticks of celery for arms. Optional – round out the ends or create small cuts to make hands and fingers! Cut baby carrots in half for easy legs! Create hair with tiny match sticks of your favorite vegetable. If you’re looking for more of a curly haired monster, try spiralizing some veggies like carrots, sweet potato, or zucchini. Fresh mozzarella balls (I got mine from my store’s olive bar) make great eyeballs when cut in half and topped with a circle of black olive! Use cabbage leaves to carve shapes out, like a crown or a pretty dress. Baby carrot rounds make cute polka dots. 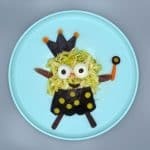 You can find this easy coleslaw monster and 9 other healthy snacks for kids in my eBook, Eat the Rainbow! 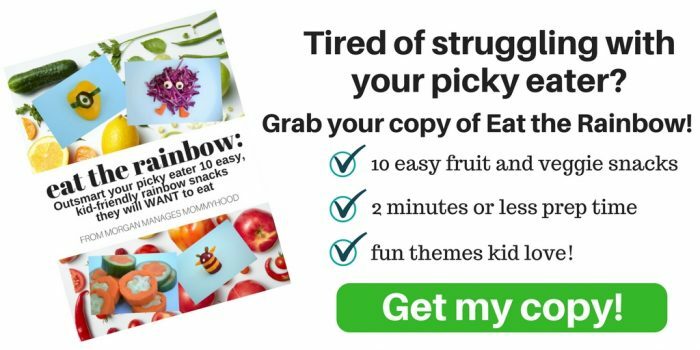 With 10 different fun fruit and vegetable snacks in every color under the rainbow, you’ll be able to trick any picky eater into trying something new. 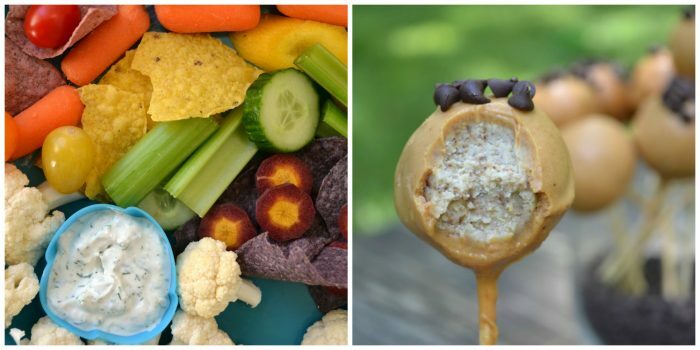 Looking for more healthy takes on kid food? Check out my post for Greek Yogurt Ranch Dip Recipe and a simple rainbow snack plate or these Healthy Cake Pops. 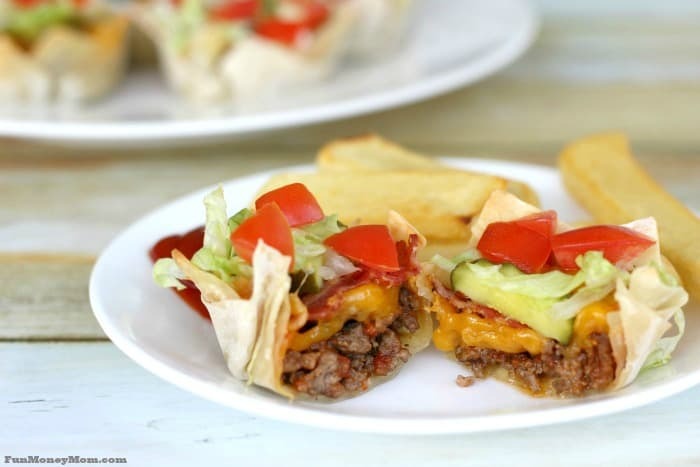 Morgan strives to make being a mom simple and being a kid memorable through realistic parenting advice you won’t roll your eyes at and fun food your kids will actually WANT to eat. 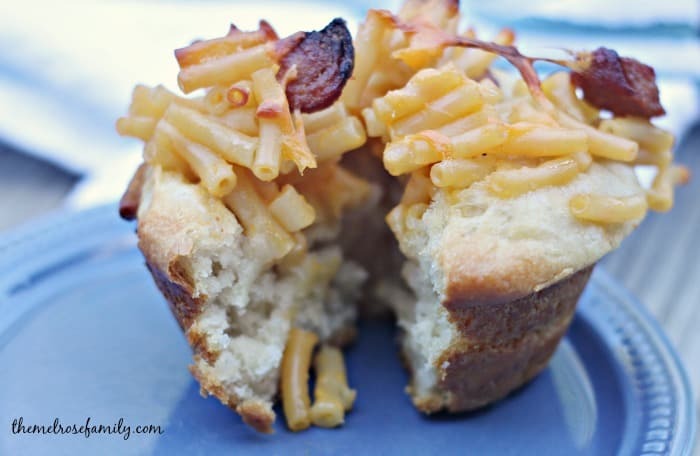 A Target loving, Starbucks addicted stay at home mom to two crazy little boys, you can find Morgan on her blog, Morgan Manages Mommyhood whipping up simple healthy food for picky eaters and laughing over spilled milk. If you liked this Easy Coleslaw Monsters recipe you might also like…. From left to right: Southern Cole Slaw, Easy Bacon Cheeseburger Cups & Macaroni & Cheese Hot Dog Cups.